These are definitely the girliest colour/combinations in my collection at the moment. Such fun on their own or paired together. I bought the pink shade 'Dance Baby' from Beauty Chamber weeks ago and Kerry popped in the sparkly glitter top coat 'Techno' as a surprise. 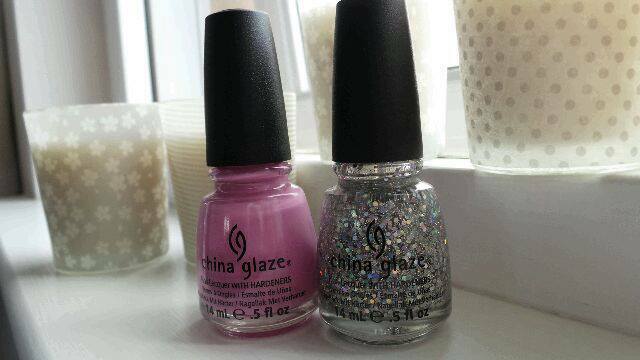 If you are familiar with the China Glaze collection, 'Dance Baby' is very similar to 'Bottoms Up. which are both gorgeous shades of pink. I found the formula really workable and non tacky. One coat of this was actually enough for me but if you prefer two then go for it but it really wasn't needed. When reviewing this product I found a complete dupe in my collection, China Glaze 'Dance Baby' is almost identical to Essie 'Cascade Cool', though with Cascade Cool you definitely need more than one coat, I find it a thinner formula than that of the China Glaze. Please note I have not photographed my own nails because they are in a state of disgrace just now - I suffer from bitemynailsitis. I love that colour pink - I have a similar one in my collection. Such a cute colour. What a great post! I love that you showed the same shade in Essie as well!! I love both Essie, OPI and China Glaze!! That is the perfect pink colour - I adore it. Excellent combination with the glitter too! I don't really like nail glitters just because of that same reason. The removing is a pain in the arse. After seeing your first photo I wasn't sure what Techno would look like on but it really does give it a nice sparkle doesn't it. Definately one of the better glitters I've seen..
Good tip about the acetone too.. I love the glitter top coat! I'm going to have to try buying some pure acetone! Ooh they look lovely together! I still don't own any China Glaze polishes and I feel like I really need to invest in some! YSL Top Secret BB Cream Review - Part 2. Looking to Advertise - join me?